We're sorry but all Material options for this product are currently out of stock. You can be notified upon their arrival by choosing the Material option you are interested in and then entering your email in the box below. Akrapovic Evolution Exhaust Systems are designed for riders that demand maximum performance from their motorcycle. The Evolution Exhaust Systems are significantly lighter compared to the stock and stainless steel exhaust systems and feature exceptional production quality, hi-tech materials and of course increased engine performance combined with pure racing sound output. 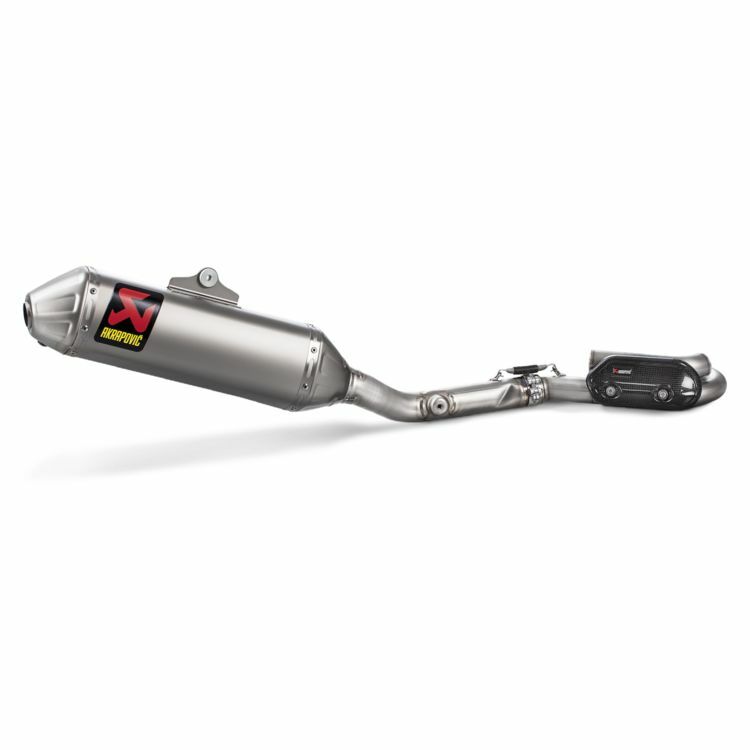 Each Akrapovic off-road muffler features a special coating on the outer sleeve giving them greater scratch resistance and allows for easier cleaning. This coating combined with the titanium end cap and welded on titanium exhaust bracket means this exhaust will last and perform season after season. Akrapovic's air-tight quality controlled and state-of-the-art production facilities are second-to-none in the motorcycle world, this ensures their pipes are perfect. The headers and mid-pipes of the Evolution Line are constructed exclusively of titanium while the Racing Line uses stainless steel. Other than the materials used the two systems are identical.